For more than 30 years, titanium implants have been used in bone conduction hearing implant systems. Titanium is a truly remarkable metal with unique properties that make it ideal for human implantation. Its ability to osseointegrate (bond) with bone is the key to making a Baha System work. Up until a few years ago, the abutment (part of the implant that sticks through the skin) was also made completely with titanium. While ideal for bonding with bone, titanium does not bond with soft tissue (skin and underlying layers). That’s why it used to be common practice to thin the soft tissue around the abutment. This technique worked well and is still performed today in some cases. However, there are many benefits to preserving the soft tissue around the abutment. These include faster surgery time, aesthetics and leaving in place as much of the body’s natural structures as possible to help prevent infections. If you DON’T thin the soft tissue around a pure titanium abutment, the skin heals down around it instead of bonding with it. This creates a pocket between the abutment and the skin where debris and bacteria can accumulate. It also blocks the immune system from accessing the area, so it’s not able to fight off potential infections to keep the area healthy. Scientists knew there were benefits from soft tissue preservation but also knew that titanium alone was not the solution. So that’s the challenge that Cochlear set our research and development team – create an abutment that would bond with the surrounding soft tissue. In 2013 we released the first abutment specifically designed for soft tissue preservation – the Cochlear Baha DermaLock Abutment (BA400). The abutment is still made of titanium, but features a special surface scientifically known as Hydroxyapatite. This is a substance that is found naturally in your body. It’s what allows your teeth to stick out through your skin and remain healthy and bonded to your gums. 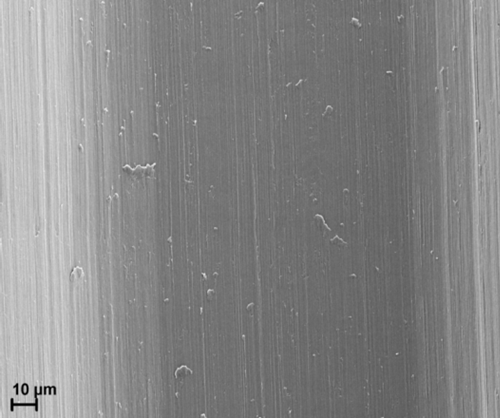 Close up view of a smooth titanium surface. 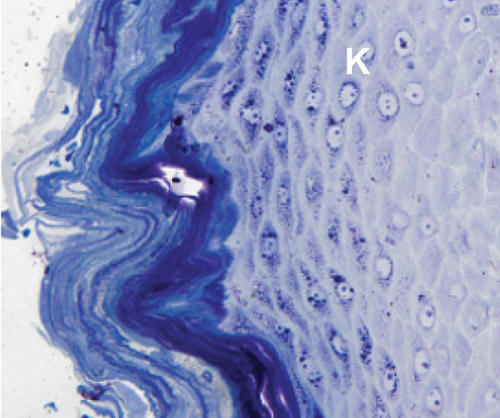 Soft tissue does not bond with titanium the same way it does with bone. Close up view of the DermaLock surface, proven to promote integration (bonding) with soft tissue. Before we release new technology there is a lot of work and research that goes into making sure our products will improve the lives of the people who rely on a Baha System to hear and be heard everyday. And after new technology is released there are always numerous, long-term, independent clinical studies that take place to evaluate and verify the benefits. By design these studies often take years to complete. This is of course also true for the DermaLock Abutment. And now the results are in! Researchers at Maastricht University Medical Center in the Netherlands have presented results that show integration actually happening in real people. They used advanced imaging techniques to study both a DermaLock Abutment and a traditional titanium abutment (used primarily by other companies) and how they react with the surrounding tissue. They concluded that only the DermaLock Abutment achieved integration with soft tissue. 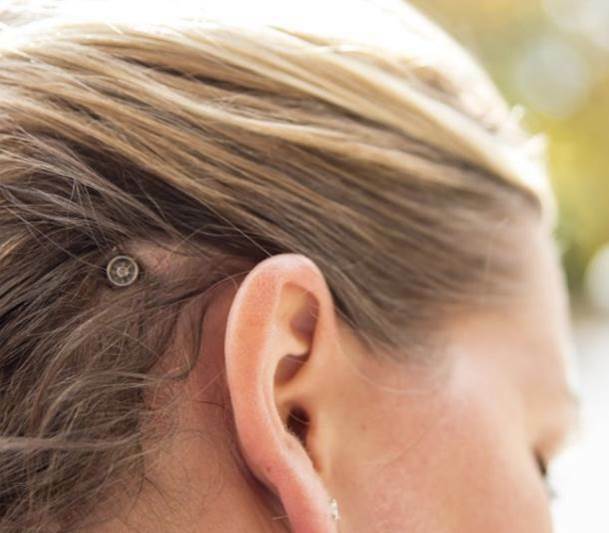 This is a great achievement and proof that Cochlear’s dedication to innovation ensures people with a Baha System have access to the latest technology that helps to make hearing carefree. 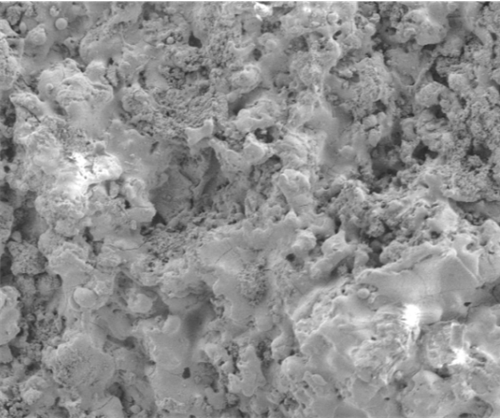 This sample was taken from around a titanium abutment. 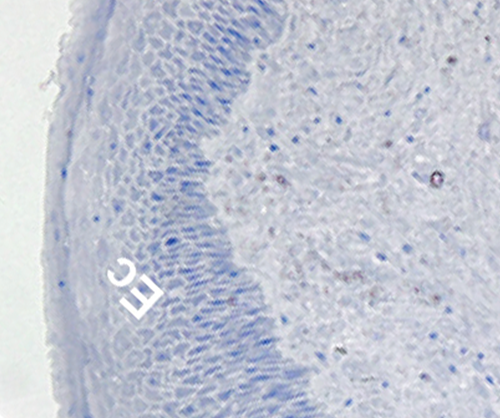 The dark blue layers resemble the outer layers of skin, clearly showing that no soft tissue has bonded to the abutment. This sample was taken from around a DermaLock abutment. The soft tissue has not hardened and resembles inner, living layers of skin. This indicates a bond with the DermaLock surface. This entry was posted in Bone conduction implants, DermaLock, In the news, Technology and tagged Cochlear Bone Anchored Solutions, DermaLock, Maastricht University Medical Center, research, technology, titanium, white paper. Bookmark the permalink.